The Oath Keepers notified the Los Angeles Police Department of the protest's cancellation. An anti-Maxine Waters protest that was set for Thursday (July 19) failed to launch after the rightwing group notified LAPD of its cancellation. According to CBS News, the Oath Keepers took offense with Rep. Waters' comments on holding Donald Trump's administration accountable for past, present, and most likely future allegations. As a result, the militia-style group made plans to protest outside of Waters' South L.A. headquarters. What was set to take place in the afternoon quickly dissolved before the congresswoman's supporters swelled in numbers. The news site states, however, that two men arrived on the scene in a pickup truck. Presumed to be detractors of Waters, the men were met with glares and their American flag that flapped on the back of their vehicle was burned by demonstrators. 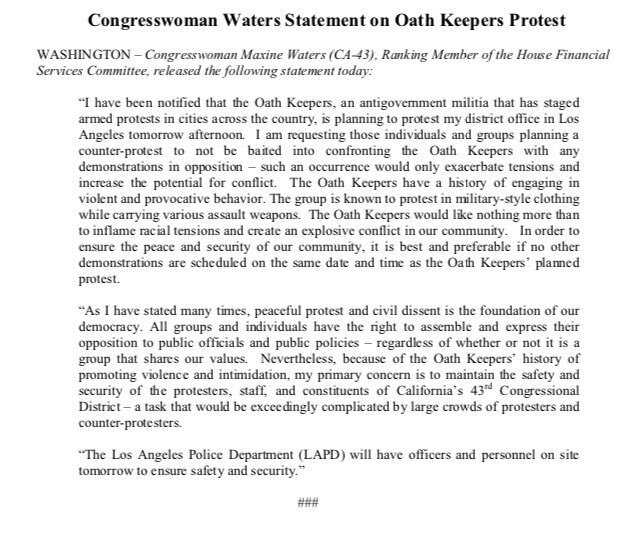 When the Oath Keepers announced its protest, Waters published a statement on the group's controversial beliefs. "This group is known to protest in military-style clothing while carrying various assault weapons," Waters' statement reads. "The Oath Keepers would like nothing more than to inflame racial tensions and create an explosive conflict in our community." She also called for peaceful reactions in case the event actually happened. The Oath Keepers claims Waters incites "terrorism," and planned to voice its support of ICE and Border Patrol. The topic of immigration has become a hot-button issue since the implementation of the Trump administration's slipshod no-tolerance policy. Waters has stood firm in her stance against Trump and his cabinet's practices, even drawing backlash from Trump who referred to her as a person with a "very low IQ." The news also made its rounds on social media with users voicing their support for Rep. Waters.